Pallid detectives who drink bloody marys and only work at night, lovelorn southern gentleman, anorexic teenage girls, boy-toys with big dewy eyes. 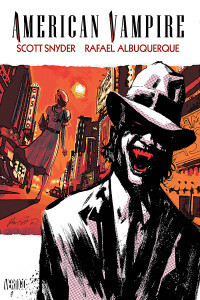 The first volume of American Vampire is split into two stories. One half of the story is written by Scott Snyder and is set in Los Angeles during the 1920’s and follows a couple of actresses that are looking to make their big break. The second story is written by “The Master of Horror” himself Stephen King. His half of the story follows the capture, escape, death and rise of Skinner Sweet, “The American Vampire“, during the 1880’s. 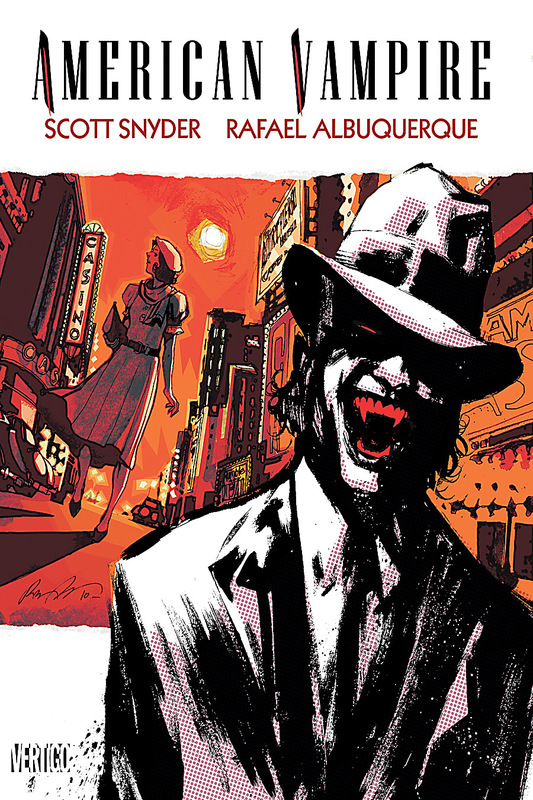 The second trade, all Scott Snyder, follows a Las Vegas Police Chief, Cashel “Cash” McCogan, as he deals with a few grizzly murders surrounding the corporate partners that have backed the construction of the Hoover Dam. Simultaneously there is a story about the Vassals of the Morning Star contacting Pearl Jones to help disseminate the location of Skinner Sweet, in addition to a story about Pearl and her human husband. The fist trade introduces Skinner Sweet and his first progeny Pearl Jones. After that Skinner Sweet can’t really be considered the main character. In the 1880’s we are given his origin story. In the 1920’s, Skinner Sweet is just a neighbor in a crappy apartment complex with Pearl Jones and in the 1930’s he is a brothel owner in a booming Las Vegas. Don’t get me wrong, everything somehow revolves around him, but he really enters and leaves the pages as a side character. I find this fascinating. There is something about that that helps elevate the uniqueness of Skinner Sweet’s character. Besides Skinner and Pearl, we have a myriad of other characters. First we have the Euorpean vampire breed. (I’m pretty sure that Scott Snyder whole heartedly believes that European vampires invented capitalism) They are behind every early American dream and or achievement you can think of in any particular era of American history. First there are the investors that are financing the intercontinental railroad in the 1880’s. Next they are the big movie producers of the 1920’s and then they end up being the silent partners that helped finance the creation of the Hoover dam during the great depression. Of course the European vampires see themselves as the best and brightest the vampire world has to offer and despise other breeds older and newer then themselves and are at constant war with other breeds, Skinner and the Vassals. Ahhh the “Vassals of the Morning Star”. The Vassals are a brotherhood as old as time that is hell-bent on eradicating all vampires off the face of the planet. They bring a lot of insight and culture to vampire genealogy as they explain trait differences between different breeds based on their country of origin. Breeds originating from Russia or the Ukraine might display certain traits and have different weaknesses compared to English or South American breeds. In addition to the background on vampire breeds and the assortment of cool information that the Vassals add to the story, they have a couple key players, descended from Skinner Sweets past. All in all, Scott Snyder weaves a pretty fascinating tale through a wide range of characters, occult and American history. I can’t wait to check out the other volumes. Until Next Time… I’m a Vertigo fanboy and love anything Scott Snyder touches. This was a good read and I can’t wait for more. 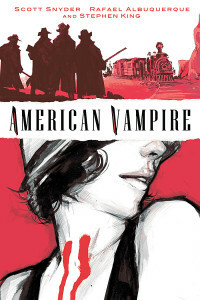 If you’re a fan of American Vampire hit me up on twitter and/or on our twitter, facebook or google+ page and let me know what you like or don’t like about American Vampire.